The origins of this drink are not known but it is widely believed that the Spritz was born during the 19th century Austrian occupation of Italy. Its name, in fact, may derive from the German verb spritzen meaning “to spray” or might be linked to the name of specific Austrian wines of the western region of Wachau. German soldiers soon got used to drinking local Venetian wines at the many taverns, but the alcohol content, so much higher than the beer they would drink back home, made them dilute it with water. Thus was born the “straight” Spritz! But the Spritz isn’t only an Italian phenomenon. 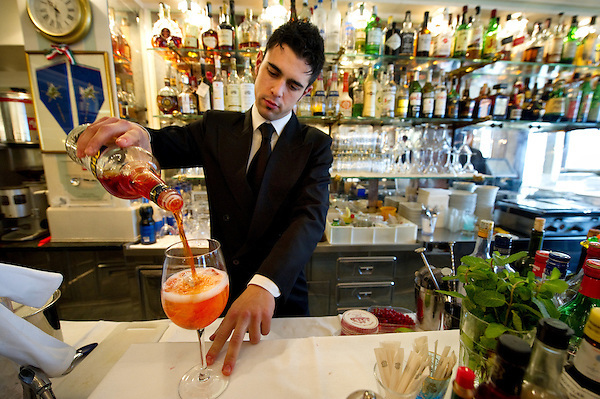 Recently, both the Spritz and Aperol are starting to take hold in many different countries, including the US. For example, in the smash hit “Meet the Parents” starring Robert de Niro, Barbra Streisand, and Dustin Hoffman, the latter offers De Niro an Italian Spritz instead of his usual Tom Collins.